Following a record-setting opening and huge box office over the MLK holiday weekend, Funimation Films, the theatrical division of Sony Pictures Television’s Funimation, reported on January 24, 2019 that the cumulative box office for “Dragon Ball Super: Broly” now totals $24M+ as the movie begins the second full week of its theatrical release. 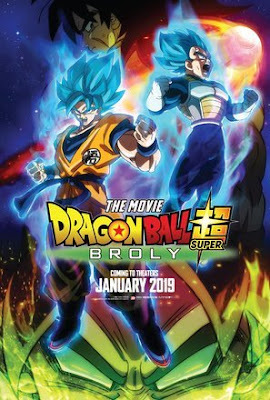 After eclipsing all previous records set by 2015’s “Dragon Ball Z: Resurrection ‘F’” in less than two days, “Dragon Ball Super: Broly” has catapulted into the top 3 highest grossing anime films of all time in the U.S. “Dragon Ball Super: Broly” will continue its run in theaters across the U.S. and Canada. Check local listing for locations and showtimes. For a complete list of locations, visit the official movie website dragonballsuperoffical.com. Based on the original story, screenplay and character designs of creator Akira Toriyama, “Dragon Ball Super: Broly” follows the events of the hit anime series “Dragon Ball Super,” the first new Dragon Ball storyline from Toriyama in more than 18 years. Since premiering in summer 2015, “Dragon Ball Super” has propelled the popularity of the franchise globally – with both lifelong fans and a whole new generation of children and teens. Funimation, a subsidiary of Sony Pictures Television, is the global leader in the world of anime. A fully integrated, next-generation entertainment studio, the company's fan-first philosophy is anchored in its omnichannel approach to its immersive offerings. From streaming and home entertainment to theatrical distribution and broadcast, Funimation's commitment to character-driven storytelling, combined with tech innovation and key distribution partnerships, provides audiences with multiple and meaningful touchpoints to connect with this immersive world. Funimation Films, the theatrical division of Funimation, acquires and distributes both anime and live action movies from prominent international filmmakers that appeal to the interests and passion of all types of fans throughout North America. For more information about Funimation, visit funimation.com.